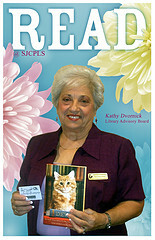 The mission of the St. Johns County Library Advisory Board is to advise the Board of County Commissioners in the establishment, operation, and maintenance of a free public library system,which will provide organized access to meet educational, informational, recreational, and cultural needs of the general public. All are welcome to attend monthly Library Advisory Board meetings on the second Wednesday of each month at 9:30 am. Please contact Library Administration at 827-6925 for older archived LAB packets.